I'm taking this moment to tip my cap to Milt Pappas, surely one of the most underrated, underappreciated players in MLB history. 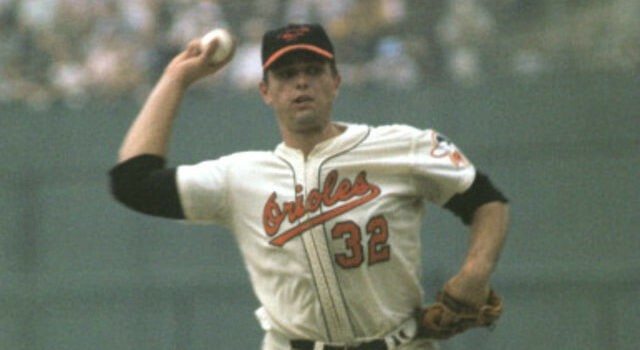 Pappas is best-known for "the main player in the Frank Robinson trade." That's fine, but why did the Reds want him so badly? Look at his stats: a career record of 209-164. 13 seasons with at least 12 Wins, a 3-time All-Star, and the NL leader in shutouts in 1971. This gentleman is worth remembering; not as fodder for Frank Robinson, but as a winner of 54% of his games over the course of his 17-year Major-League career - he won between 12-17 games in 13-out-of-14 seasons - how many players in Major-League history can say they won 12+ games in 13-out-of-14 seasons? Probably less than 50. In a sport where 10% means a lot, Milton Steven Pappas was well-above average as a Major-League pitcher - easily in the top-half of all pitchers measured over the course of history. Don't ever forget: If it wasn't for Milt Pappas, the Orioles might not have gotten Frank Robinson (think about that for a moment).